Your ‘Not To Do List’ For Happy Holidays! It is very easy to forget that holidays are the time to have fun. I think this is especially true for women as they are frequently the ones trying to make everything work out. We have super long To Do Lists and although it feels good to check items off it can also mean you are so busy doing things on your list that you don’t have the time or energy to actually enjoy yourself. 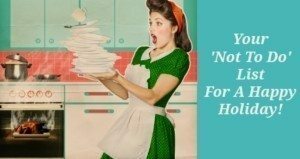 So whether you are thinking about Thanksgiving, Hanukah or Christmas here 5 things to put on your DO NOT DO LIST! To Do: Listen To Yourself & Ask How Do I Want To Celebrate This Holiday? Ask yourself what is it that you (yes you, not your mom, mother-in-law, partner), want the holiday to look like. Often we are so busy making sure everyone else is happy that we end up frazzled and disappointed. When we listen to what we want it might mean that you have to ask your family to compromise. It’s okay to speak up, really it is! That way when the holiday is over, even if certain things happened that did stress you out, there will be good memories too. Holidays are largely based on traditions and when you find your partner, especially after you have your own children, there are usually two sets of family traditions shouting for your attention. I am sure there are certain traditions that stem from your childhood that you want to make sure your kids have too (the same probably goes for your partner and his family). But let’s face it, your life is already busy and your hands are full so how do you think you are going to fulfill all of those expectations of what a holiday should be like? Also, remember you are looking back with the rose-tinted glasses of childhood where things were done for you. You probably only remember the delicious holiday meal, not the frantic shopping and cooking that happened to get it on the table. Sit down with your partner and discuss and choose one or two things you each want to make sure happens because it means a lot to you. Yes, one or two things, not ALL of the things you are picturing. Let’s stop doing traditions that don’t work for us anymore just because we always have done it that way. You can’t have a meaningful holiday until you decide what it is about the holiday that makes it meaningful to you. I can see you rolling your eyes and saying “Come on, how on earth will I be able to make time for myself when I have so much to do?” I know I am a stuck record but I’ll say it again – if you don’t look after yourself you won’t have the reserves to take care of other people! What does it look like when our reserves are low? We’re cranky, overly sensitive and generally not as happy as we want to be. Pay attention now to what makes you feel better so it is more of a habit when the holidays come. Also, think of Thanksgiving as a testing ground for Hanukah/Christmas which tends to go on longer and involves present buying so probably demands more of you. See what works and what you need to tweak to take even better care of yourself. Small breaks of downtime are probably more attainable than a day at the spa. Do something just for you every day e.g. a long shower or soak in the tub, a coffee alone at Starbucks reading a magazine for half an hour or really time doing just about anything, as long as it relaxes you. Don’t ignore the basics – get enough sleep and eat food that leaves you feeling good, not bloated and sluggish. I am always talking about the 80/20 diet and maybe during the holidays we can switch it to 70/30 or even 60/40. 70% of the time you eat your fruits and veggies, lean proteins and wholegrains but 30% of your food intake is whatever you fancy. You don’t want to get in to the trap of feeling deprived then overeating. Also, if you do overindulge don’t think well I’ve blown it now, I just as well eat this whole buffet table’s worth of food. Take a breath, don’t feel guilty or angry with yourself. Just start again from now (not tomorrow, Monday or January 1st!). Holidays usually mean spending time with families and that of course means spending extended periods of time with people you love but who know how to push your emotional buttons. It’s hard to hold in hurt feelings and irritations and still be calm. 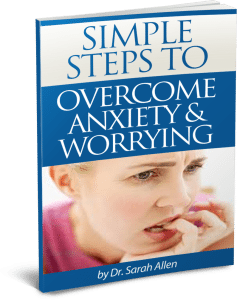 Problem solve and ask yourself is it worth trying to sort this relationship out right now (actually on the special day the answer is always no), do a calming deep breath (see my blog post Need A Simple Way To Keep Calm? for an effective way to get calm quickly) and resolve to either always ignore it or work on a way to resolve relationship difficulties it in the New Year. It is also important to vent and not just simmer about whatever it is that has frustrated you but pick the right person to vent to. Your partner may be great hearing about how your mom is so frustrating but not so great if you are criticizing his mom. You want to choose someone who has some emotional distance from the situation, has a lot of empathy and will not bring it up against you in the future. Pick a neutral person, give them a call or even a quick text that says “Agh!!!! !” and know they will reply with “Hold in there!” Or “Anything I can do?” It’s nice to know someone has your back. If some relationships with family members have a long history of leaving you with frustrated it can be good to get advice ahead of time and come up with a plan of how it is best to react if a difficult situation arises. Lastly, Make Sure Self Care Is On Your Definitely Do List! I think that the most important holiday stress management tip is to make sure you spend a little time each day to check in with yourself and ask whether you looked after your own emotional and physical needs at some point today. Don’t feel guilty that you are thinking about yourself. If you look after you and take the time you need to not feel overwhelmed, cranky or stressed, the holidays (and every other day of the year) will be much happier for everyone. What Can I Do Right Now That Will Help? 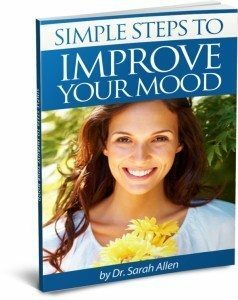 So I put together a booklet with some strategies I am always saying to my clients to help them begin to improve their mood. I hope that you will find it helpful too. If you would like to set up an appointment to come and talk with me please contact me at 847 791-7722 or on the form below. I have written five other booklets that you might find interesting. See each specific webpage to download one or many or visit my blog for many posts about all these issues.